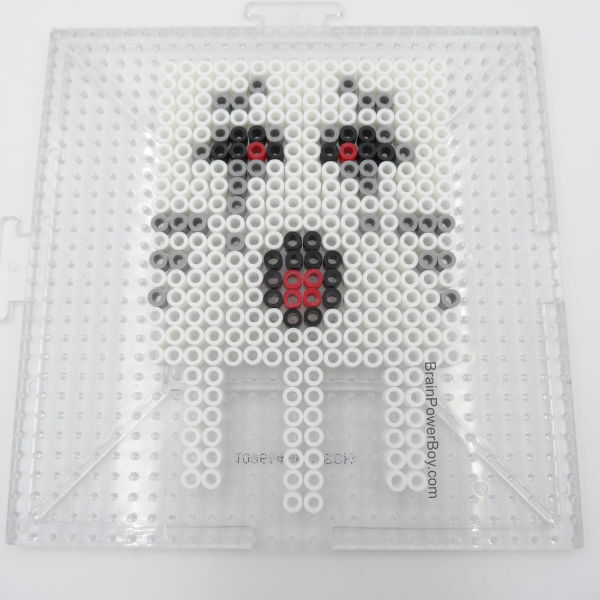 Interested in making a Minecraft Perler Bead Ghast? My son designed one you will love. Today we are back with another Minecraft idea. 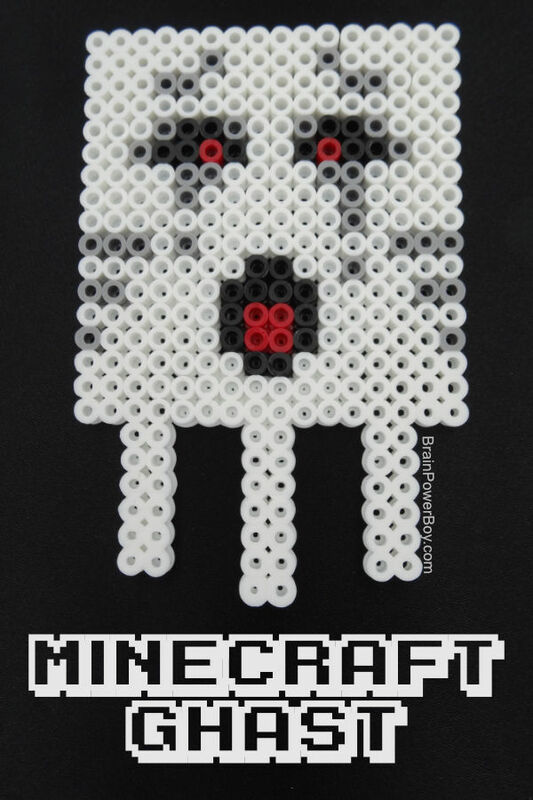 This time he made a Minecraft Perler bead pattern Ghast. Ghasts inhabit the Nether in Minecraft and are a hostile mob. They are shaped like a cube and have tentacles hanging below. They shoot fireballs at players. I think they look like a blocky ghost. My son has been making these for me to share with you. I think he did a great job! I hope you enjoy this post which is part of a series of on Perler Bead patterns. To see all of the Perler Bead Supplies we recommend click this link. To make a ghast I will give you some basic directions and dimensions. Use the images for reference. The ghast is 24 beads high and 16 beads wide. 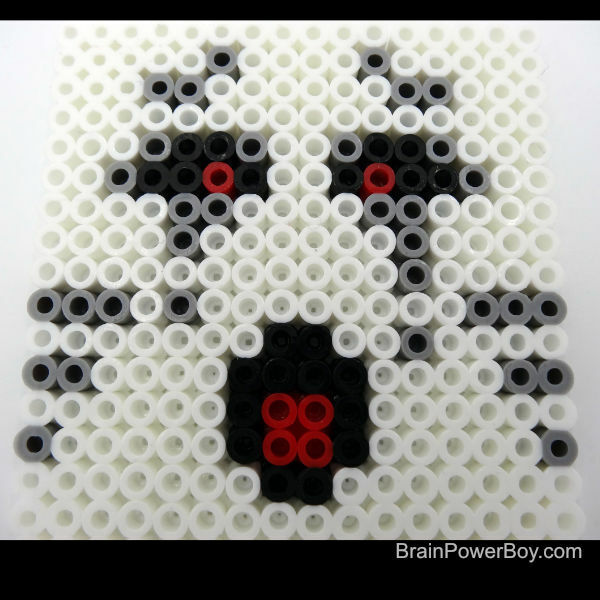 It uses white, grey, black and red beads. To follow along on the pattern for the face, use the close up image below. The mouth is 5 beads high. Note that the eyes are not exactly the same on each side so be sure to follow the picture. There are three tentacles which are 2 beads wide. Two of the tentacles are 6 beads high and the one in the middle is 7 beads high. It is still amazing to me how many things you can create with Perler Beads. We have really enjoyed working with them. You can make just about anything! Here is a picture of the finished Ghast. We like to iron our projects so the beads are barely melted. that is the look we like but you can iron it more if you want to. Some people iron theirs almost flat. Surprisingly, we have had no trouble with them falling apart even though we do not iron them more. If you have a child who is going to play with their Ghast a lot, you may want to iron a bit more than we did so you can be sure it will stay together. I hope you enjoy my son’s Perler Bead Ghast Pattern. We have a few more Minecraft ones to post so be on the lookout for those.